Below is a lightly edited transcript of our episode on Proposition 5, which would give homeowners over 55, and a few others, the ability to take their low property tax rates with them to a new house. It is essentially an extension of Proposition 13, which was put into place 40 years ago. OLIVIA ALLEN-PRICE: I'm Olivia Allen-Price, and we're on day three of Bay Curious Prop Week. Today, we're digging in on Proposition 5. SCOTT SHAFER: Proposition 5 would basically expand Prop 13. ALLEN-PRICE: Prop 13 passed 40 years ago and gives property owners low, low property tax rates with only tiny increases. And now with the state — and especially the Bay Area — in the middle of a housing crisis, voters are being asked to double down on Prop 13. SHAFER: Problem is, it doesn't really increase the housing stock. ALLEN-PRICE: Today, Erika Aguilar and the team at "The Bay" podcast will dig into the pros and cons of Prop 5. Stick around. SHAFER: So let's start at the beginning. First of all tell me your name and a little bit about yourself. SHAFER: Kenneth Wilkins is a longtime resident of North Oakland. AGUILAR: Scott Shafer is senior editor of the California Politics and Government Desk at KQED. SHAFER: Just spell your name for me. SHAFER: He's been there... He was born basically in the area. SHAFER: And so you moved here, you said '86? SHAFER: It's a beautiful neighborhood. It's very quiet... tree-lined streets, mostly single-family homes, a few larger apartment buildings. There's a lot of construction going on. WILKINS: It seems like everyone who purchased a house, they are refurbishing it. SHAFER: He was walking me down the street. WILKINS: This house was the Dickson's here. And they were here when I came in 1976. And this one here, Mr. Armstrong — he helped us with some plumbing. AGUILAR: So he's been on the block for 40 some years. How much was that house when he first bought it? WILKINS: Actually it cost less than this car. WILKINS: This car cost $21,000 I think. And it was less than that. SHAFER: It was like a Toyota. But it wasn't a Tesla. It was like a beat up Toyota. AGUILAR: Wow. So that's just representative of what the housing market looked like back then. SHAFER: It's not something he could find in the cushions of his couch. He had to get a loan. But nonetheless you get a sense of how much it's gone up. Those houses now sell for three quarters of a million or more. WILKINS: I never dreamed that a house would be sold for over a million in this neighborhood. AGUILAR: I want to get into Proposition 5, but before we do that, I feel like we have to talk about Proposition 13. So can you tell me the story of how Proposition 13 became a California law? SHAFER: Yeah, you have to go back to the late-to-mid-1970s. Jerry Brown was governor. NEWS CLIP: After two terms of Ronald Reagan's conservatism, California voters, who elected Jerry Brown as governor last year, were expecting several changes in state policy. SHAFER: The cost of everything was going up quickly because inflation was high, and back then, local governments could raise the property taxes whenever they wanted to. And so if they needed to pay for something, they raised property taxes a little bit, and so people's tax bills were going up as the value of their homes went up. NEWS CLIP: Inflation's hit the standard of living particularly hard here and soaring property taxes have been a major factor. SHAFER: People, especially seniors, on fixed incomes were having a hard time staying in their homes. And at the same time the state had a pretty big budget surplus. And so there was all this talk in Sacramento about, "Well gee, why don't we give people a tax rebate?" SHAFER: But that didn't happen. So there was this frustration building. HOWARD JARVIS: I am forming the American Tax Reduction Movement for the United States. SHAFER: There were two guys, Howard Jarvis and Paul Gann, who became the spokespeople for this tax revolution. NEWS CLIP: And the purpose of this amendment is, number one, to reduce the amount of money that government takes in in taxes because we think the only way you can cut spending is to not give them the money in the first place. AGUILAR: What was the reaction to it? How popular was it back then? SHAFER: It was really popular. NEWS CLIP: Proposition 13 caused what may be a record voter turnout. SHAFER: I mean this was a really overwhelming passage. It probably got about 65 percent of the vote in 1978. JARVIS: We have proven that here in California, that we the people, not the politicians, are still the boss. AGUILAR: Proposition 13 did a few things. First, it taxed homes based on their 1976 values. Then for anyone buying a house after that, Prop 13 set the property tax rate at just 1 percent of home sales price. And it can only be increased by a maximum of 2 percent each year until the house is sold again. SHAFER: It has taken a lot of money away from schools. Those local property taxes are used to fund programs including education. I think when Prop 13 passed, California was near the top in per pupil spending. Now we're more toward the bottom. AGUILAR: Back to Ken. What does Proposition 13 mean for him? Like how does it affect him considering that there's a lot of movement along his block? SHAFER: Well, he's clearly benefited from it. SHAFER: And do you remember if you voted for it? WILKINS: I think I did. SHAFER: His tax bill is, I don't know exactly what it is, but it's a lot less than somebody who lives next door and just bought the house and is paying taxes based on the market rate assessment. AGUILAR: Can people move their low property tax rates around right now? Or does it just stick to the house or property that you own? SHAFER: If you're 55 years or older or severely disabled, you can buy a home of the same or less value and take that with you to another county... if that county has agreed to accept that lower value. AGUILAR: So not all counties are in on this. SHAFER: Not all counties. In fact, most counties are not, so just about 10 of the 58 counties in California have agreed to accept this lower tax rate. AGUILAR: So what problem is Proposition 5 trying to solve? CLIP: California realtors have an important chance to protect California's homeowners and extend much needed property tax protection to seniors. SHAFER: They have these big homes that they're rattling around in, and they really would like to downsize. The problem is they've got this great deal on their property tax because they've been there so long and so they know if they move and buy a market value home, their tax rate is going to go way up. CLIP: It will remove an unfair move-in penalty or property tax spike that prevents many seniors from selling their single family home in order to downsize or move closer to their children. SHAFER: The argument here is that they will sell their big house, move to a smaller house and free up their bigger house for young families that want a three- or four-bedroom place. The problem of course is can a young family afford to buy that house? AGUILAR: Who has introduced Proposition 5? Like who backs it? LYNDA EISENMANN: Hi, my name is Lynda Eisenmann. I'm a broker, real estate broker in California. SHAFER: The California Association of Realtors — and their national association as well — have kicked in at least $7 million to collect the signatures to get it on the ballot and then presumably to spend some of that money to help get it passed. They have an interest in it. You know, if you sell a house you get a commission, so they like that. EISENMANN: It's when people stay put that we have a more stagnant market in general. AGUILAR: OK. Who's on the other side? Like who is against Proposition 5? SHAFER: Local governments are opposed to it. SHAFER: Tenants groups. Yeah. I mean all these groups, including education advocates, they're afraid that schools are going to get less money. David Chiu is an assemblyman from San Francisco. He is a big opponent of Prop 5. He thinks it's a big tax giveaway to people who don't really need it. CHIU: Prop 5 is an enormous tax break for longtime wealthy property owners who get to pile on more tax breaks on top of what they already have. 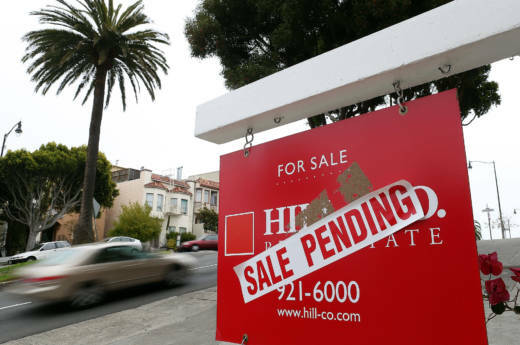 While renters and first-time home buyers continue to face higher home prices it does nothing to actually address the housing crisis, and it continues to exacerbate the income inequality that is unfortunately the story all over the state of California. SHAFER: And the legislative analysts who analyzed this said it's going to ultimately cost local governments about a billion dollars in lost revenue in the coming years if Prop 5 passes. AGUILAR: Wow. So what does Ken think about Proposition 5? Does he think he's going to vote for Proposition 5? SHAFER: You know he's really thinking about it. He's not sure. He clearly would benefit himself. On the other hand, he's not in a big hurry to sell his house and move. In fact, he said "I'd like to be here till I'm 99 years old." WILKINS: In our case, I don't think we will sell the property. We'll pass it on to our grandkids and the grandkids' kids and so forth. My daughter said, "No don't sell it. Don't sell it. When we get old enough, we won't be able to buy a house." Which pretty much came true, right? SHAFER: She was right. That said, I think he likes the idea of Prop 5, but also he's very thoughtful. WILKINS: I think it might affect the tax base for those other counties or cities. SHAFER: You're right. And what would that mean? WILKINS: Actually it would be something, I mean, to really think about before you voted against it or for it. ALLEN-PRICE: Now Prop 5 is not the only housing-related prop on the ballot. The one getting the most attention is about expanding rent control, Prop 10. We'll have a whole episode about that one on Friday. But there are a couple of other housing props we want to flag for you. First, Prop 1. VOICE OVER: Should the state issue $4 billion in bonds to fund the construction of affordable housing? ALLEN-PRICE: Money from Prop 1 would be used to give out low-interest loans for multi-family housing projects. It would also be used to help veterans buy homes. This would give California more housing, but some people say the real barrier to building is bureaucratic red tape and this wouldn't address that. The $4 billion bond would ultimately cost California taxpayers just short of $6 billion over the next 35 years. And then there's Prop 2. VOICE OVER: Should the state be allowed to use money intended for mental health services to pay for housing for homeless Californians? ALLEN-PRICE: Back in 2004, voters passed Prop 63 which raised taxes on millionaires to fund mental health services. Lawmakers want to use some of that money to pay for housing for people with mental illness. But it's not clear if they can legally do that. Prop 2 clears everything up. It would allow the state to issue $2 billion in bonds to fund housing projects for people who are homeless and have mental illness. And it would let those bonds be paid back using tax revenues from Prop 63. The so-called housing first method has worked to curb homelessness elsewhere, but putting this money toward housing would mean there would be less going toward treatment and other services. ALLEN-PRICE: I know we've thrown a lot at you today, so if you have more questions about any of this — especially Prop 5 — we're having a Facebook Live where we can dig in even more. That'll be on Wednesday, Oct. 17 at noon. You can RSVP ahead of time so you won't miss it. Details at BayCurious.org. You can also check out KQED's Voter Guide at kqed.org/elections. ALLEN-PRICE: Thanks to producer Jessica Placzek, politics editor Scott Shafer, and our friends at "The Bay" podcast: Erika Aguilar, Vinnee Tong and Devin Katayama. Love you guys. ALLEN-PRICE: Tomorrow we're talking about the props that could impact our health care in California — and potentially the entire country. Bay Curious is made in San Francisco at KQED. I'm Olivia Allen-Price.